Kennesaw, Ga. – After upgrading to their third POLAR cutter from Heidelberg, Hodge Printing expects to have a 20 percent increase in production. 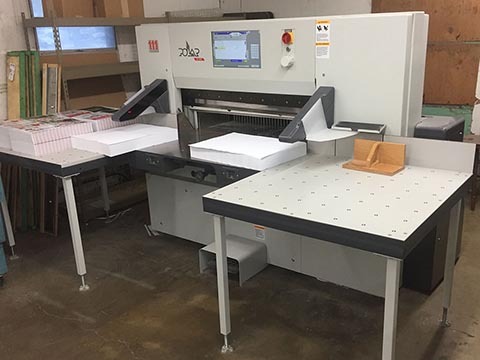 A long-term POLAR customer, Hodge Printing of Dallas, Texas has added to their postpress department with the high-speed POLAR N 115. Replacing a 30-year old cutter, the new investment is a more modern machine that helps improve their efficiency, productivity, and costs. Thanks to the intuitive cutting program generator, the POLAR N 115 offers the shortest makeready time and is the most efficient cutter in the market. With the OptiKnife, Hodge Printing can expect an extended operating life of their knife and quicker knife changing times. The POLAR-Positioning-System-DPS gives them the greatest cutting accuracy for their 1,150 inch format. All of these benefits have contributed to Hodge Printing’s 20% decrease in makeready and cutting times.